The purpose of this case study is to encourage the advanced practice nurse to examine the abdomen, even during episodic visits. Most patients with Wilms' tumor appear relatively healthy. 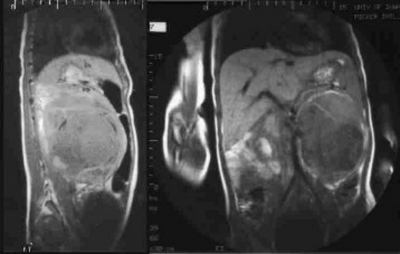 The majority of children with any malignancy present with vague and general symptoms similar to the child in this case. While Wilms' tumor patients may present with hypertension (75%), abdominal pain (30%), and microscopic hematuria (20%) (4), detection of an abdominal mass drastically narrows the differential diagnosis of these concurrent symptoms. In this patient a left upper quadrant mass is detected. This paper discusses the differential diagnoses to consider for the school-aged child with a left upper quadrant mass along with the current literature recommendations for management of abdominal masses found in the primary care setting. Our patient is a 5 year-old, Caucasian female who presented to the primary pediatric clinic in early spring with chief complaints of cough, fever by touch, and decreased activity for six days. Her nine-year-old sister was in the clinic that day for similar symptoms and tried to speak for our patient during the history gathering, “Yeah, she's really tired and doesn't want to eat anything, either. Can you fix her?” Our patient said nothing and tucked her face into her father's collar. Our patient's illness began with rhinorrhea and progressed to appetite loss and fever that her parents felt was unresponsive to acetaminophen. No home remedies or additional medications were tried. Her father, the historian, denied our patient had any diarrhea, constipation, or urinary difficulty. Our patient's past medical history was unremarkable. There were no recurrent sinus, middle-ear, or urinary tract infections, nor were there any congenital problems noted. Past surgical history consisted of left eye ptosis correction at age one. Birth history revealed an uncomplicated full-term vaginal delivery. This child had no allergies, daily medications, or herbal supplements. Her development was normal, immunizations were up-to-date, and her health had been good since the last annual physical the previous winter. Family-social history consisted of a working mother and father with hospital-related occupations, living in a house in the suburbs outside of a major city. Neither were smokers. There was no family history of neoplasms, gastrointestinal problems, seizure, congenital heart problems, hemoglobinemias or other major illnesses. Our patient was in daycare where others have reported similar symptoms. On physical exam our patient appeared worrisomely “sick”. She was fatigued and completely indifferent to this examiner as well as the uncomfortable aspects of the exam, unlike most children her age. Her temperature was 101.6 degrees Fahrenheit axillary, pulse regular 122 beats per minute, and respirations 36 breaths per minute. Blood pressure was not obtained. The outstanding physical findings consisted of a slightly erythematous throat with Grade II tonsils; visible, clear, drainage in eyes, nose, and postnasally; an occasional dry cough; bilateral erythematous, swollen turbinates; and 1 cm mobile, nontender, tonsillar nodes bilaterally. Her left eye had minimal residual ptosis, but all structures, including the iris were normal. The chest revealed a gallop without murmur heard over the apex at the left fifth intercostal space, midclavicular line, more than likely due to the high-output state of fever and anemia, depicted later in the laboratory data. On abdominal exam a mass of 9 cm width by 4 cm length with regularly shaped margins was palpated with light depth and verified with percussion in the left upper quadrant. The mass was smooth, slightly firm, oval, nonmobile, and did not cross the midline. The child denied pain during the exam, but guarded and panted during palpation. Labs consisted of a complete blood count and differential revealing a low hematocrit and hemoglobin with microcytic, hypochromic red cells. Slight granulocytosis was also noted. See Table 1 for complete results. In the clinic, our patient was diagnosed with a febrile viral upper respiratory illness, anemia, and an abdominal mass. Our patient was medicated with Tylenol in the office for fever, and her father was educated on home management for the viral upper respiratory illness. The father was then instructed to have diagnostic imaging done that day at a local community hospital to determine the origin of the mass and possibly help determine the cause for anemia. 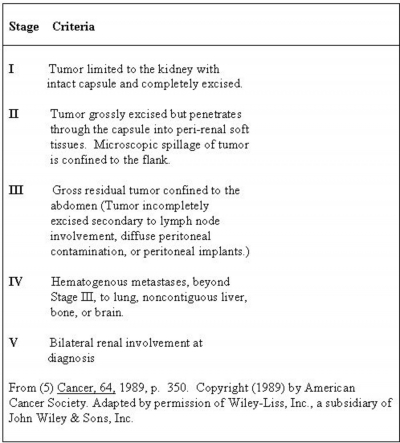 The ultrasound revealed a heterogenous mass consistent with Wilms' tumor in bilateral kidneys, defined as Stage V. See Table 2 for tumor staging criteria. Our patient's computerized tomography scan (CT) and magnetic resonance imaging (MRI) helped determine the location and further staging of the individual bilateral Wilms' tumor using the same I-IV criteria described in Table 2. Bilaterally, our patient's Wilms' tumor was stage II. Our patient was then admitted to the children's hospital after her fever and upper respiratory symptoms subsided for biopsy, central line placement, and treatment with vincrinstine, actinomycin-D, and doxorubicin. Biopsy confirmed diagnosis of Wilms' tumor Stage V with each tumor at Stage II and favorable histology. The tumor was shrunk with chemotherapy for five months and then removed from the left kidney via complete nephrectomy and partial right nephrectomy. Our patient was a typical Wilms' tumor discovery in the primary care setting. Approximately 50-85% of children with Wilms' tumor present with a palpable abdominal mass, usually found incidentally (4,5). Overall, Wilms' tumor incidence is 7.8 cases per million children (3). Stage V accounts for less than 5-10% of Wilms' tumors (3). Peak age of incidence is 2 to 3 years of age, or 99% occurring less than six years of age (2,6,7). Wilms' tumor diagnosis in infants less than six months and children older than ten years is rare (2,6,7). Children presenting older than three, mainly African-American, usually have an unfavorable histology that is known for its recurrence and metastasis into the lungs (2). Both sexes have similar incidence (2). Therefore, Wilms' tumor should be highly considered in any school-aged child with an abdominal mass. Wilms' tumor is also highly associated with other congenital anomalies such as aniridia, hemihypertrophy, hypospadius, and kidney malformations such as fused, horseshoe or polycystic kidneys in as many as 12% of patients (8,9). Thirty-three percent of children with anridia develop Wilms' tumor (8). Our patient did not possess any of these anomalies. Our patient also had no family history of neoplasm. Fifteen to 30% of children inherit the tumor with approximately 1% having another family member with Wilms' tumor (6,10). Wilms' tumors may be inherited in an autosomal dominant fashion with the dysfunction or deletion of the Wilms' tumor suppression gene along chromosome 11 possibly causing nephrogenic rests (1). A large majority of tumors arise from nephrogenic rests, defined as embryonic precursor cells of renal tissue that persist beyond 36 weeks gestation (11,12). Ninety-nine percent of patients with bilateral synchronous Wilms' tumor and 30-41% of unilateral Wilms' tumor have nephrogenic rests, or nephroblastomatosis (10,11). This makes it very possible that Our patient had nephro- blastomatosis with her bilateral condition. Wilms' tumor arises anywhere in the kidney as embryologic precursors to renal cells. These cells mimic normal development of the kidney and consist of three components: blastema, epithelium, and stroma (3). A favorable histology consists of well-differentiated cells, or cells that appear closely related to normal cell sources such as those mentioned (2,8). Unfavorable outcomes are typically related to the anaplastic cell with diffuse or focal involvement, making up 10% of Wilms' tumor cases (1,13). The anaplastic cells are undifferentiated, which means they appear so abnormal, their origin cannot be determined (2,13). These cell types are more aggressive in their growth and behavior. Diffuse anaplasia bears the worst prognosis (13). Our patient's histology was luckily favorable. Wilms' tumor usually spreads past its pseudomembraneous capsule into renal sinuses, intrarenal lymphatics and blood vessels (14). Intratumoral hemorrhaging in 8% of patients will seed and spread this fragile tumor (14). Common sites for metastasis are the lungs, regional lymph nodes, and liver (6). Wilms' tumor usually expands perilobularly, displacing the urinary collecting system and causing calcifications (8,10). This explains why microscopic hematuria occurs in 25% of patients (6). Our patient's urine happened to be heme-negative on microscopic analysis at the referral center. Wilms' tumor also produces renin causing hypertension in 25-75% of children (4). Our patient fell into this category with an admitting blood pressure of 115/69, defined as the 95% for systolic blood pressure for her age group (15). Wilms' tumor grows rapidly. Zoubek and colleagues estimated its doubling time, the time required for cell numbers to double in size, to be approximately 11-13 days (16). It usually takes approximately 30 doublings to make up a 1 cubic centimeter mass or 1 gram of tumor, which takes up to a year, would more than likely be unpalpable, but detectable by ultrasound at that point in growth (16,17). Tumor growth is not completely linear with a rapid acceleration of growth that eventually slows with increasing size and cell death (17,18). After the tumor reaches 1 cubic centimeter, it takes only approximately 7 doublings to increase in size to approximately 500 cubic centimeters using an eleven day doubling time, which may continue to be difficult to palpate (16). In our patient's case, the tumor's retroperitoneal location made it difficult to palpate the mass until it had become very large, displacing the kidney. Wilms' tumor's short doubling time is what most likely makes this tumor susceptible to chemotherapy and accounts for its low mortality rate (17,18). Most cases of bilateral renal involvement have a 3-year survival of 75%-81% using combined chemotherapy and radiation (2,8,12). For patients having single kidney involvement, long-term survival is usually 80-90% (1). Treatment is chemotherapy and nephrectomy for single kidney involvement with excision of tumor cells and preservation of normal cell functioning for bilateral kidney involvement (1). Combination chemotherapy and radiation are given as a pretreatment in high-risk cases such as the bilateral renal involvement, diffuse anaplasia, or metastases (1). This is done to possibly shrink the size of the tumor (1). Once our patient's abdominal mass was discovered, the focus of her differential diagnosis was instantly narrowed to a few diagnoses, particularly with the left upper quadrant mass presentation. 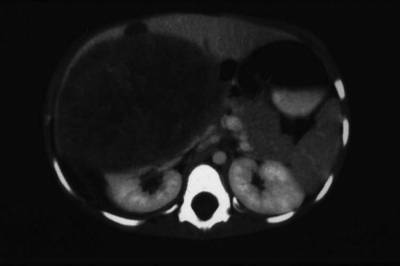 Considering the narrow range of differentials for this mass, any school-aged child presenting with left upper quadrant abdominal mass should have other cancers, splenomegaly, and kidney malformations ruled out. Following is an explanation of these differentials. It must be noted that none of these differentials could have been definitively ruled out in the office setting, but this narrow range of differentials merits the potential seriousness of any abdominal mass detected in the office, none of which has extremely identifiable symptoms surrounding it. It is with this caution in mind that all children have routine abdominal exams even on episodic visits. The incidence of Wilms' tumor is low, however the incidence of abdominal masses in childhood cancers is high. Abdominal mass presentation is often associated with neuroblastoma, non-Hodgkin's lymphoma, and rhabdomyosarcomas (6). Sixty-five percent of primary neuroblastoma tumors arise in the abdomen, usually the adrenal medulla, causing gross hematuria (6,7). The mass is generally painful, crossing the midline, nonmobile, with an irregular border, almost opposite of our patient's abdominal mass (14). The incidence of lymphoma is higher than neuroblastoma with 13.2 per 1 million children diagnosed annually (19,20). Eighty percent of Burkitts lymphoma, a type of non-Hodgkins lymphoma, presents with an abdominal mass (19,20). This painful mass also presents with lymphadenopathy, intestinal bleeding, gross hematuria, and fatigue (19,20). Rhabdomyosarcoma presents as an abdominal mass in the retroperitoneum, trunk, gastrointestinal tract and genitourinary tract, with the majority of masses presenting in the head and neck (37%) (2). The mass is painless, asymptomatic, and causes gross hematuria and hypertension when involving the kidney (1). In these three diagnoses, this patient history could have fit the clinical presentation, but only diagnostic imaging would have revealed the true cause (12). Overall incidence of childhood cancer is 150 cases per 1 million children, and the second leading cause of childhood death (6). Palpable spleens are not completely abnormal in healthy children (21). A 1-2 cm spleen palpable just below the left costal margin that is soft and non-tender is found in about 10% of healthy children (21). It is differentiated from other masses by its movement on respiration and medial splenic notch (21). This mass was abnormally large for a normal spleen, nonmobile, had no splenic notch, and did not follow diaphragmatic movements. Also, the top of the mass could be felt below the costal margin, which is out of place for a spleen. As an aside, there are rare cases of wandering spleen in children under 10 years. This is caused by weakness of the spleno-renal and gastrosplenic ligaments, which allow the spleen to float anywhere in the abdomen (22). Conversely, an enlarged spleen is common in different etiologies especially in children (21). It is the most common left upper quadrant abdominal mass in children (21). Although splenomegaly is not a diagnosis, the finding can be very diagnostic of other etiologies. Routine illnesses are the leading cause of splenomegaly (21). Putting countless viral and bacterial infections aside, our patient's history and symptoms were very suggestive of splenomegaly secondary to Epstein-Barr virus or leukemia. The classic triad of exudative tonsilitis, cervical lymphadenopathy, and splenomegaly may not present in the young child with Epstein-Barr virus (23). While 90% present with fever and 50% present with splenomegaly, other features may include otitis media, respiratory infection, or abdominal pain (23). Blood counts usually reveal a leukocytosis with 50% mononuclear cells and 10% or more atypical lymphocytes, but heterophil antibodies (revealed in the Monospot test), can often be absent in a child under 4 years (22,23). This patient did fit some of the described presentation, but she lacked the leukocytosis and impressive lymphadenopathy, while her complete blood cell count only revealed a mild granulocytosis with anemia. Granulocytosis may indicate an acute bacterial infection, viral infection, or an invasive tumor, but this is not particularly diagnostic (24,25). Leukemia is the most common malignancy diagnosed in childhood, making up one-third of all malignancy (26). Leukemia accounts for 4 out of 100,000 cases per year from ages 2-6 years, primarily Caucasians (26). Essentially, bone marrow is replaced by abnormal, poorly differentiated cells (26). This accounts for symptoms of bleeding, fever (usually falsely related to upper respiratory or middle ear infection), splenomegaly in 61-70% of cases, repeated infection, lymphadenopathy, hepatomegaly, and joint/bone pain (27). 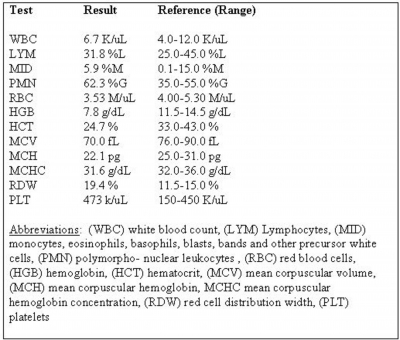 Complete blood count generally shows white blood cells <25,000 in 65% with lymphocytosis and lymphoblasts, hemoglobin <8 g/dl in 50-95%, platelets 10-49 X 109/L in 34%, and an absolute neutrophil count of <500 cells per microliter (26). Referring back to our patient's labs, she lacks the lymphocytosis, thrombocytopenia, and neutropenia associated with leukemia, although this does not completely eliminate leukemia. Both hydronephrosis and polycystic kidney may present in childhood and are considered a major cause of abdominal mass in children (28). Hydronephrosis is defined as dilation from one or both kidneys caused by an obstruction in urine flow, often secondary to infection is this age group (29). Hydronephrosis usually occurs 1 in 1,000 births and 1-2 out of 10,000 adolescents (29). The abdominal mass is usually painful causing gross hematuria, and decreased urine output (10). The polycystic kidney infrequently presents in childhood. Normally, there is the autosomal dominant form presenting in the 4th-5th decade of life and an autosomal recessive form that presents at birth and occasionally in childhood (30). These children are more likely to have bile duct involvement, hepatic failure, and renal insufficiency (30). It must be noted, however, that polycystic kidney is four times as likely to develop into Wilms' tumor (30). Careful history can direct the practitioner in referral and exam. With any abdominal mass, a detailed history of the child's voiding and stooling patterns must be obtained, an importance this case demonstrates. Additionally, the clinician should have a high index of suspicion for a diagnosis of malignancy, especially in this age group. Steuber (1999) stated, “all masses in the abdomen should be considered malignant until proven otherwise” (31). For this reason, assessment of family history of neoplasms and additional physical anomalies were key issues in this case. Recommendations for a primary care office work-up of an abdominal mass consist of a complete set of vital signs. A blood pressure reading may have revealed hypertension pointing to renal disease, especially in our patient's case. Additionally, laboratory work should include a complete blood count with differential and spun urine analysis, to detect microscopic or gross hematuria. As this case demonstrates, these laboratory results could alert the practitioner to serious conditions, such as: anemia, lack of identifiable infection, and hematuria. Imaging studies are the most important diagnostic test for abdominal masses in the literature (10,11). Our patient's clinical picture, considering the differential diagnoses presented, could have fit any other diagnosis. Only radiologic imaging could conclusively make any diagnosis. Imaging studies should begin with a complete abdominal ultrasound because it can accurately differentiate renal or extrarenal masses and cystic or solid tumors, unlike plain abdominal or chest films (11). Findings from current literature recommend an abdominal ultrasound by a radiologist with pediatric experience within 24 hours if there is no known origin of an abdominal mass (1,3,14). As the differential diagnosis is slim for left upper quadrant masses with other possibilities being potentially very serious, it is key to identify the mass as quickly as possible. The abdominal ultrasound revealed the location and the nature of this tumor as well as ruling out a host of differential diagnoses. It is also important to gather as much history and laboratory data as possible. For instance, upper respiratory symptoms in a child may not be the result of a viral illness alone, but a symptom of an underlying diagnosis involving malignancy when paired with an abdominal mass, such as in our patient's case. Therefore, it behooves the clinician to perform abdominal exams on routine and episodic visits. As for our patient, she skips into the office for a primary clinic visit after her hospital stay. The tumor completely obliterated the function of the left kidney and partially affected function of the right kidney necessitating her left nephrectomy and partial right nephrectomy without complication. Our patient's sickly demeanor has disappeared and healed surgical incisions are all that physically remain of what could have resulted in a fatal outcome. Copyright: © 2015 Nguyen SN. This is an open-access article distributed under the terms of the Creative Commons Attribution License, which permits unrestricted use, distribution, and reproduction in any medium, provided the original author and source are credited. NNT is a 4 years old boy, a second born in the family of three. He stays with both parents and brothers in Haiphong, Vietnam. NNT’s pregnancy was unplanned and he was delivered through caesarian section. He was never admitted in neonatal intensive care unit and has no history of neonatal sepsis or jaundice. NNT was breastfed for one year and his developmental milestones are appropriate for age, and immunizations are up to date. NNT’s parents started noticing a left sided mass, initially small but however became progressively large and asymmetrical. Prior the child had haematuria with frank blood and clots intermittently. The child would also cry on passing urine and they decided to bring him to Haiphong Children Hospital. The child was pink, well-nourished and apyrexial. Blood pressure ranged from 110/65-125/75 mmHg. Weight: 15 kilograms, height 100 cm . • CVS-heart sounds were normal. • RS-equal chest expansion and air entry. • GIT-the child was feeding well, no changes in bowel habits. This was the first admission but after scan confirmed that it was a Wilm’s tumor the child was commenced on chemotherapy to shrink the mass before surgery [2,3]. The abdomen was soft and non-tender, right sided abdominal mass was felt which was freely mobile with smooth edges and it did not cross the midline, one could easily get above and below it. • Right sided abdominal mass. 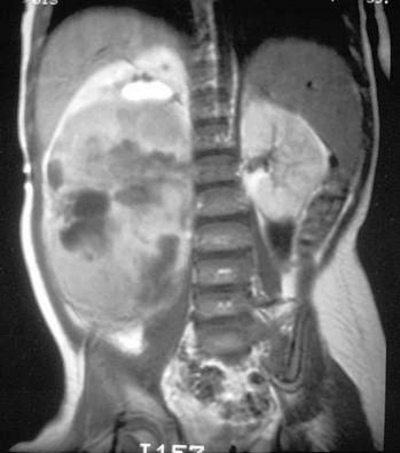 Abdominal Scan revealed a solid mass with cystic areas in the lower upper quadrant arising from the right kidney and measuring 12 cm by 9 cm, appearences were consistent with a right Wilm’s tumor . The child was taken for nephrectomy in theatre under general anaesthesia. Right sided renal mass was resected. After surgery the child was taken to PICU on nil orally for 24 hours, ringer lactate 56 mls hourly for 24 hours, rocephin 500 mg intravenously 12 hourly, metronidazole 100 mg iv 8 hourly, ketamine infusion 1-2 mls per hour for pain, post-operative FBC and U&E, strict intake and output targeting urine output of 10 mls per hour, oxygen per face mask and routine monitoring of vital signs . NNT recovered well in PICU and was discharged back to ward after three days where he stayed for seven days. He came for review and the child was doing well, histology results of the resected mass further confirmed a wilm’s tumour . • To look at the area after treatment to help determine if it has worked. Screening for Wilms tumour is very important for children who have syndromes or birth defects known to be linked to this disease. For these children physical exams by a specialist and ultrasound exams on a regular basis are recommended (for example, about every 3 or 4 months at least until the age of 8) to find any kidney tumours when they are still small and have not yet spread to other organs. Wilms tumour can also run in families, although this is rare, testing can be done on parents to see if they have passed the mutation on to their children. Heitkemper DL (2006) Medical Surgical Nursing Assessment of Clinical Problems (7thEdn). Mosby, St Louis. Greene DM (2002) Wilms' Tumor. In: Rudolph AM, Rudolph CD (Eds) Chapter 20.12. Rudolph's Pediatrics (21stEdn). McGraw-Hill Companies New York 1614-1616. Abeloff MD, Armitage JO, Lichter AS (2000) Pediatric Tumors. In: Abeloff MD, Armitage JO, Lichter AS, et al. Edn Chapter 80. Clinical Oncology (2ndEdn), Churchill Livingstone, New York 2346-2394. EDLIZ (2011) Essential Drug List and Standard Treatment Guidelines for Zimbabwe (6thEdn), WHO.